One of my favorite movies is Under the Tuscan Sun, staring Diane Lane again one of my favorite actresses. She plays a 35-year-old San Francisco writer named Frances Mayes, whose, perfect life takes a unexpected detour. Her seemingly happy San Francisco marriage ends abruptly and she goes into a funk. Urged by her friends to move on, she joins a bus tour of Tuscany where, on the spur of the moment, she buys a crumbling villa. She assembles a crew of oddballs and immigrants to repair the house; over the next year, as they work, she welcomes one of her New York friends who's pregnant and at loose ends, and she seeks love, first (tenuously) with her married real estate agent, then with a charming stranger. Although life gets in the way of love, Frances's wishes come true in unexpected ways, and there's always the Tuscan sun. The scenery in this movie is breathtaking from the winding roads, a small towns, to the rolling fields of sunflowers that seem to go on forever. I love sunflowers, from their enormous size, a 32 inch (82 cm) sunflower head that grew in British Columbia. (Source: 2004 Guinness World Records) and the most heads on one plant; according to the 2004 Guinness World Records, a sunflower grown in Michigan had 837 heads on one plant. 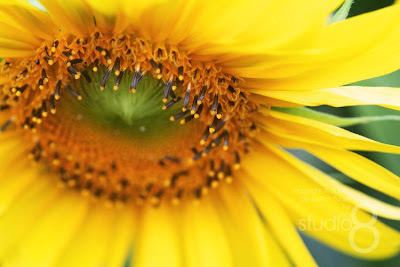 It is said that the sunflower plant has an almost 'human-like' characteristics and dimensions. Maybe this is the reason why so many of Europe's greatest artists such as Van Gogh , Monet, and Gustav Klimt used the sunflower as their subject matter. My brother and sister-in-law planted some sunflowers a few years ago in there backyard and during one of our visits I took the above spectacular photo. I had just purchased a new Marco lens and was itching to try it out, and was beyond impressed by the end result. This lens lets you get so close its almost as if you could pick one of the seeds out yourself, it is so close. So I am itching to take a trip this fall to Italy, spend some time enjoying the warmth of the sun and to see the fields upon fields of this glorious flower. One of the options I am looking at is Cooking Vacations they offer a variety of different vacations such as women only tours. I am looking at the Positano Cooking~Food Tour~Water coloring~Journal Writing~Travel Photography & Tea Talk it covers all the things that I love. Check it out maybe you too will get the itch and join me this September.